Willow can be used either straight from live cuttings or from cuttings that have been dried and then rehydrated to make them flexible enough to work with. We offer a variety of workshops some of which are suitable for beginners to willow work. Suitable for complete beginners and utilises simple techniques to make a willow platter that can be used for bread/oatcakes or as a pot stand. The technique is then built on in the second part of the session to make a simple Celtic frame basket. 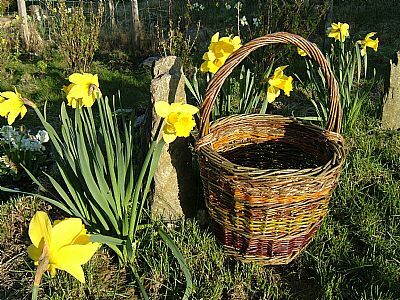 This is for people who have done a little basket making before: you’ll learn the skills required to make a small round basket with a basic handle. This workshop shows you the skills required to make decorative and functional objects for the garden such as obelisks for training runner beans or climbing plants and hurdles for use as gates or fencing material. Suitable for beginners. This workshop utilises living willow cuttings which can be pressed into the ground and will then regrow. These can be woven in a variety of patterns to produce ‘fedges’ (living willow hedges), tunnels, arches and domes. As living structures (willow cuttings can grow 3-4m a year in the right conditions) these will continue to grow and strengthen and will require training/pruning in coming years. They will also produce an early source of nectar and pollen for foraging bees as well as a source of willow for your own projects.